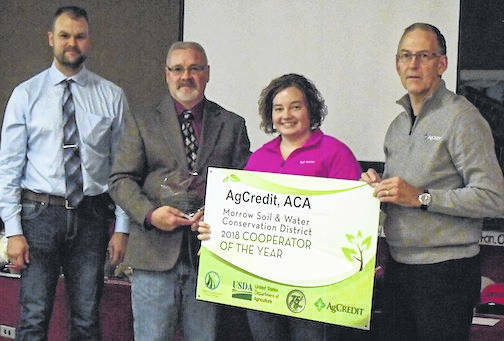 Ag Credit was the winner of the Cooperator of the Year Award when the Morrow County Soil and WaterConservation District held it annual banquet. Pictured, from left, are Mike Sayers, SWCD board member; Dan Barker, program administrator who presented the award to Andrea Bayles and Dan Ebert, from Ag Credit. Pictured are representatives from four of the nine affiliate members of the Morrow County Soil and Water Conservation District:, from left, John Groves, Farm Credit Services; Andrea Bayles, Ag Credit, Brayden Barnett, Central Ohio Farmers Co-Op and Bill Creswell, from the Morrow County Dairy Association. Other affiliate members are Nutrien Ag Solutions, Morral Companies, Broerman, Tidy Tim’s Inc. and POET Bio-Refining. Two hundred people were served fish dinners by members of Jenkins-Vaughan Post 97 of the American Legion, when the Morrow Soil and Water Conservation District held its 69th annual meeting and banquet Saturday, Dec. 1, at the Post 97 home in Cardington. Highlights of the evening included the naming of Ag Credit as the Conservation Cooperator of the Year. Accepting the award were Ag Credit members Andrea Bayles and Dan Ebert. Presenting it were Mike Sayers, SWCD board member and Dan Barker, SWCD program administrator. Awarded scholarships were Jacob Kirkland, who received the McGinnis Family stipend; Blake Clapham, the Down Home Farm Scholarship; Kayla Barker, the Wuertz Family award and Ellie Logan, the Steve Ruhl scholarship. Re-elected to the SWCD Board of Supervisors was Mike Sayers. Other members are Jay Smith, Larry Leonhard and Tom Clark. Affiliate members are Nutrient Ag Solutions, Morral Companies, Central Ohio Farmers Co-Op; Farm Credit Services, Ag Credit, Broerman Insurance Agency, Tidy Tim’s Inc., POET Bio-refining and the Morrow County Dairy Association, the latter providing the dairy products for this dinner. The Soil and Water staff, whose members are Dan Barker, program administrator and Matt Stooksbury, SWCD Technician, each gave presentations on what has been accomplished throughout the year including the Headwaters programs, the Ag Study tour in September and different services offered including the no-till drill rental and recently, the Farmland Preservation program. Entertainment was provided by Al Frazier and Jay Smith gave the welcome. Warren Davis, commissioner, offered the invocation and Tom Clark introduced special guests.